Tapping multiple holes simultaneously usually requires either of two type of drivers, either a lead screw drive with reversing or a tapping machine with automatic reversing at the set depth. Both are expensive and less available than such simple machinery as drill presses and vertical milling machines, as made popular by the Bridgeport mills. 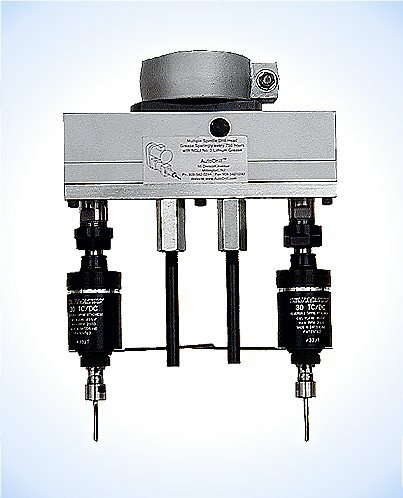 A tapping machine with a lead screw feed and reversing is used for Class 3 specification threads. It feeds the tap exactly one pitch per revolution. Its' disadvantage is that with any lead screw only one particular pitch can be tapped. A change in the lead screw feed is required to do different pitch threads. It is also not capable of drilling or reaming. Our multiple spindle heads can be attached directly to this style machine since all our spindle rotate in the same direction and are geared at a 1:1 ratio. Drilling machinery with reversing capabilities can use our multi-spindle heads to tap. The depth at which the spindles reverse must be capable of being set with a sensor or be timed by the operator. If timing by the operator is required a reasonable skill level is necessary. These machines can tap any pitch within their speed and feed capabilities. Automatic feed is not used. The feed is set by the operator's motion. A versatile setup, requiring less skill is offered by AutoDrill. We mate multiple self-reversing tapping heads to the multiple spindle head to convert any single rotation drilling machine into a tapping setup. The tapping heads have the added advantage of incorporating both start and feed cushions to the spindle. These features reduce tap breakage and allow a clean start to the threads. These heads can also re-engage into existing tapped holes to either clean the thread or for thread inspection. Any thread pitch can be made with the setup.